Kid D's first day of kindergarten. Before he learned how to fake sickness or comb his hair. So, as I sit here trying to come up with inexpensive, fun, creative, indoor/ outdoor party games, crafts and foods for five and six year olds that do not break any of the expressly written school party guidelines (“Spitting of any type should be avoided” – I kid you not) or offend / exclude any specific race, religion, creed or sexual orientation, I very naturally went into procrastination mode and started thinking about the fact that Kid D is going on to first grade next year, and before I know it he will be graduating from high school. 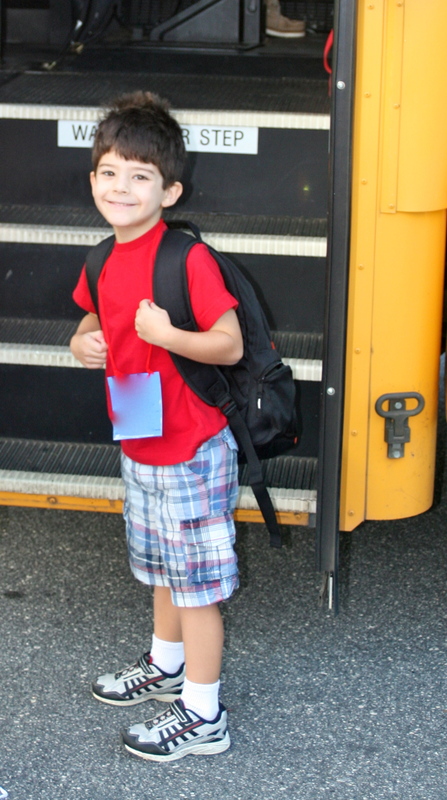 Then I started recalling all of the fun times we had over his first year of “real” school. Like the second day of school when he started crying less than five minutes before the bus pulled up – over something completely inane – and got himself into such a tizzy that he wouldn’t even get on the bus when it was time. I then had to try to stem the meltdown and figure out what he was upset about. No luck there, but he seemed a little better after a few minutes so I drove him to school and had to walk him inside (still in my pajamas with coffee breath, no doubt) because we were now late and he had to be signed in. When we got to the lobby he started a whole new level of screaming and crying that became so disruptive that the actual principal came out of his office to see who was apparently being violently murdered in his hallway. So that’s how my son and I met the school principal. And also there was the time when I was at a sporting event for another kid and a parent came over to introduce herself to me as the mom of one of Kid D’s female classmates. She told me how much of a charmer my son is (I am aware) and that all of the girls in the class think he is dreamy (I was not necessarily aware of this) and then she asked me if I heard that Kid D told her daughter that he was going to kiss her so hard that he would knock her teeth out (um, zero awareness of this and actually at a loss for words). I’m going to have to keep an eye on him. Or the time that I realized that playing video games was clearly having a negative impact on Kid D’s behavior. He apparently thought that staying home sick meant he could spend all day playing Wii in the basement. One particular Monday morning back to school was really bad. As per usual, Kid D claimed he was “sick.” I was on to his scheme by then and wasn’t having any of it. When threatened with losing everything electronic forever and TV for several weeks if he didn’t stop crying and get on the bus he replied, “You’re meaner than the meanest person I thought you were!” Then he stormed off to his room. I was furious, but I followed him and calmly replied, “I said ZERO electronics, so NO LIGHTS!” and the room went dark. He’s had some great times this year as well. He is reading chapter books fluently on his own. He lowered his Hate of Writing from DEFCON 3 to just simple dislike. He has gained a ton of independence and is learning all of the ropes of the elementary school jungle. He is an outgoing, confident, smart kid who makes friends easily and plays sports well. We are incredibly blessed to have him as a son. I just hope I never get a call from the school principal telling me that he just knocked some girl’s teeth out. How am I ever going to explain that one?